Nora Beth is my (current) favorite human for many, many reasons. One of them being that her build up to and recall of things are always much more positive and enthusiastic than actual reality. Davey worked an insane number of hours this weekend, so NB and I had a whole lot of one-on-one time, and by this afternoon, I knew we needed to mix up our routine. We headed out to Aw Shucks Farm, and no one in the world was more excited than NB was about the “fom” and “ANIMALS!!! Sheep! GOATHS! Lotsa punkins!” She talked about all of them nonstop on our drive. Yet, when we got there, she was terrified of all the animals and didn’t actually want to see any pumpkins. There were indeed pigs, horses, rabbits, roosters, turkeys, sheep and goats that she could pet and see. Instead, she clung desperately to me and hid her face from the animals. After a long break to slide and swing and run around, we tried again, and she eventually warmed up to the bunnies (she tried to feed them dirt with a plastic spoon, which shockingly they were not into) and did “pet” the “sweet sheep” with one finger. She still wanted nothing to do with the horses and only wanted to watch the pigs, goats and turkeys from a safe distance. In the car on the way home, over dinner, and in the bathtub, you wouldn’t know that, though. Instead, she recapped our trip as though she were Jack Hanna, making dear friends with each creature. In her mind, she ran the farm. And you know what, NorBeff, you did. You did. I haven’t had many notable cravings this pregnancy, but I thiiiiink about buffalo chicken more times than is probably normal. I’ve only capitalized on that a couple of times in the last 30 weeks, but as I was meal planning yesterday, I knew this was going to be a week of ultimate buffalo creation. I couldn’t find one that I loved, and I decided I wanted to create a slider with buffalo flavor, creaminess, a little bit of crunch and some blue cheesiness. So I set about making my own today. And let me just tell you… the build up was amazing. The recap was incredible. And the reality of eating them was extraordinary. In a crockpot, add chicken breasts, onion slices, ranch seasoning and most of a bottle of Frank’s (the amount is really based on how big your chicken breasts are… just make sure they are totally covered. This took me most of my bottle). Cook on low for 6 hours. Shred chicken in the crockpot then drop in 2 oz. of cream cheese, allow to melt, then stir to combine. Heat oven to 350. Arrange slider buns on a cookie sheet. 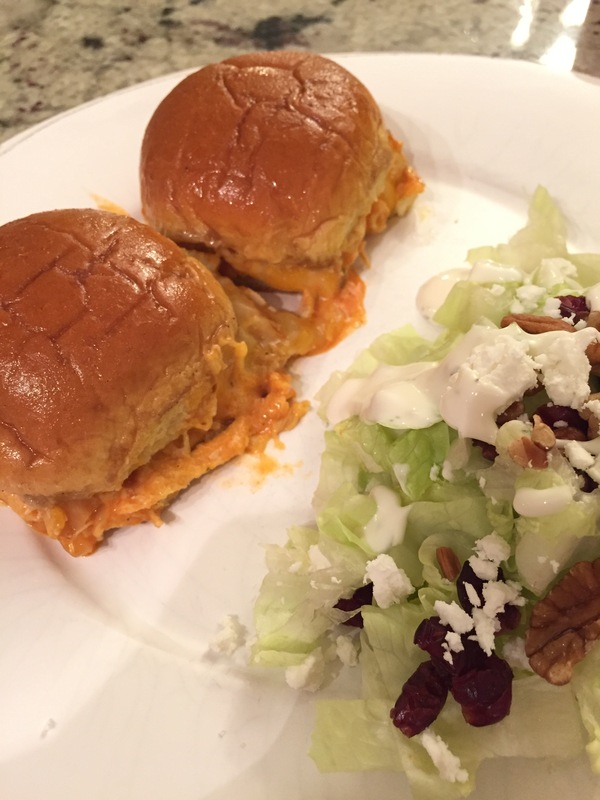 Spread blue cheese dressing on bottom bun, top each with a pile of chicken, onion + sauce mixture (from the crockpot), top with shredded cheese, spread blue cheese dressing on top bun and complete sandwich. Meanwhile, in a small saucepan, melt butter and Worcestershire together and sprinkle in salt and white pepper to taste. Brush over the top assembled sandwiches. Bake at 350 for 12 minutes. Lick yo’ fingers.